The company is also investing €9.25 million in a packaging plant in Belfast. THE COMPANY BEHIND drinks brands Guinness and Rockshore has announced plans to move to 100% recyclable packaging, ditching the plastic rings and shrinkwraps from its products. 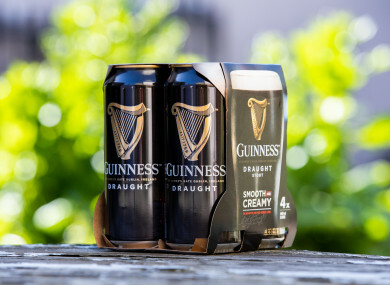 Diageo – which supplies Guinness, Harp, Rockshore and Smithwicks – said it would replace plastic rings around cans of beer with biodegradable cardboard. The company also said it will be investing €9.25 million in its bottling and packaging plant in Belfast and will see the new biodegradable packaging hit shelves in Ireland by August this year. Plastic pollution has become a growing concern globally in recent years as large amounts of plastic is being found ingested by marine creatures and washing up on shores. In January, Agriculture Minister Michael Creed called on fishing trawler operators to help remove some of the plastic from shores around Ireland. The move by the beer supplier will reduce plastic on a scale equivalent to removing 40 million 50cl plastic bottles, which if laid out in a row, could stretch from London to Beijing, it said. It currently exports beer to more than 100 countries including the United States, China and the Middle East. Oliver Loomes, country director of Diageo Ireland said: “Managing our environmental impact is important for the planet and the financial sustainability of our business. “For 260 years Guinness has played a vital role in the communities around us. We already have one of the most sustainable breweries in the world at St. James’s Gate and we are now leading the way in sustainable packaging,” he added. Individual cans are already fully recyclable including the widget inside cans of Draught Guinness. Email “Diageo announces plans to remove plastic packaging from cans of Guinness”. Feedback on “Diageo announces plans to remove plastic packaging from cans of Guinness”.